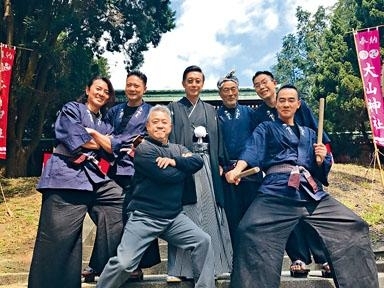 The Eric Tsang Chi Wai produced, Chin Kar Lok directed Lunar New Year film GOLDEN JOB (WONG GUM HING DAI) was shot with the original YOUNG AND DANGEROUS (GOO WAT JAI) team. Dior Cheng Yi Kin, Jordan Chan Siu Chun, Chin Kar Lok, Jerry Lamb Hiu Fung, Michael Tse Tin Wa and Tsang Chi Wai would form an all new adventure team in the film with explosive fights and exciting car chases! Chan Siu Chun and son Jasper became popular on a Mainland reality show. Siu Chun admitted that many evens would approach them, but he only brought Jasper onto the program originally to foster their relationship and for his son to have a happy summer. After the program aping he sent his son back to school in Hong Kong and would not permit him to join show business in such a young age. Ekin said tha Siu Chun changed a lot after becoming a father, but he would not be tempted to become one. Ekin said, "When I go married we agreed, we don't want (children). Playing with other people's is more fun." Ekin also revealed that while shooting in Hungary he immediately his shoulder while performing a car jumping stunt. As for Siu Chun he pulled his back muscle during a scene and once worried about his reproduction abilities. He kept the injury from his wife Cherrie Ying Choi Yi until he went to the hospital.